Having a personalized direct mail design is only one piece to the puzzle. Just as important as having something be personal, is that it also be applicable. 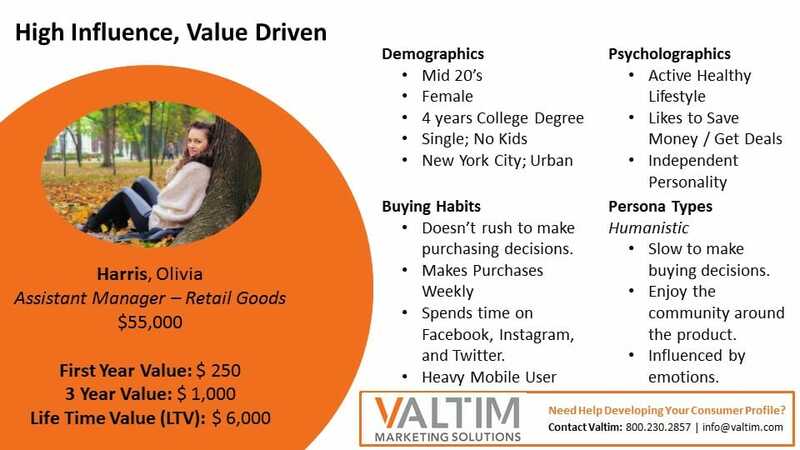 Valtim Marketing Solutions works with our customers to build out consumer profiles that would be the best fit for the specific targeted marketing campaign. Based on those profiles Valtim is able to develop a targeted direct mail marketing list guaranteed to improve responses and convert leads into paying customers or supporting members. Modeling your core customer is one of the most vital steps to a successful marketing campaign. Valtim marketing solutions uses big data to help your organization identify consumers who meet a specific profile likely to engage with your marketing strategy. This includes building out targeted lists that use data from multiple sources to improve open rates, replies, and conversions. Geo-targeting is the process of creating a market segment based on location data. This location can be as broad as an entire state, or as accurate as a specific neighborhood within a city. Not only can Valtim Marketing Solutions help identify high value regions, we can cross reference other targeting data points within the specified regions. Demographic targeting is the process of creating market segmentations on one (or more) demographic data points. These demographic data points could include age, gender, race, marital status, family type or more. Valtim Marketing Solutions can work with you to develop targeted mailing lists that match your ideal customer / member. A type of demographic targeting, economic targeting specifically segments users based off of economic indicators. These indicators may include such information as income level, net worth, employment status, home ownership, lifestyle, and education. By understanding your target markets financial ability to respond Valtim can help your business improve conversion rates. For organizations that specialize in Business-to-Business (B2B) transactions, Valtim Marketing Solutions can help build out a direct mail list that targets specific companies (and individuals within those companies). Depending on your campaign we can also cross-reference data points against businesses KPI’s that signify higher likelihood of response.